The weather here in the Midwest has been brutally cold and snowy, which has been preventing me from getting much work done on my woodworking project I mentioned a few weeks ago. I normally use my garage for cutting larger pieces of wood, but my garage has frequently been below freezing and often covered with salty sludge. But I have at least finished one project: I needed to come up with a way for my wife’s new office to receive faxes even though she switched to Twilio SIP for phone. The solution I came up with uses a Raspberry Pi, custom Node.js code, and Twilio Programmable Fax for a (very) low-cost fax server that both receives incoming faxes and has a web interface for sending faxes. The final result is available on github. Installation is a multi-step, manual process. And received faxes are stored in a Maildir format so that multiple computers can access the files through POP3 (which is probably not how everyone wants to retrieve received faxes). But the code is open-source and easy to modify, so it could be tweaked to meet your requirements if you need an inexpensive way to send and receive faxes without an actual fax machine connected to an old-school phone line. 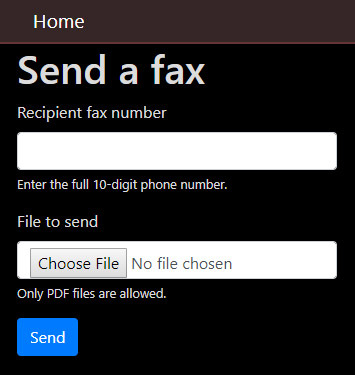 Example web interface for sending a fax. If you install it for yourself, let me know what you think!